If you thought the whole idea of the BMW i8 as an extended-range EV was impressive, just wait until you get a look at some of the tech it has on it. After all, BMW designers are German and it is impossible for them not to do things perfectly. Even things like the key fob and the headlights are amazing. The i8 will be the first production car to feature laser headlights. Sadly, these can’t be used to cut through the car crawling ahead of you, or even to blind your enemies. But they do illuminate five-times better than the LED versions currently in use. Laser light much more closely matches the ‘color temperature’ of sunlight, which means that as well as being brighter than normal lights, it is also actually easier for the human eye to see with it. The technology behind laser headlights is both simple and complex. It is simple in so far that lasers themselves are pretty well-understood technology. What BMW’s funless, gray-faced engineers have done is run these lasers through a phosphor which adds yellow tinged light, and then diffuse the beams so they form a tightly focused cone. They only turn on as high beams, and then only above 40 km/h. That’s because, despite being diffused, BMW doesn’t want them to shine in anybody’s eyes for too long, which might happen if the car was going slower. However, the i8 is after all a BMW. This means not only will it rarely be traveling below 40 km/h, the brights will always be on. At least we will know who is coming. As for the key, its more complicated than some phones. 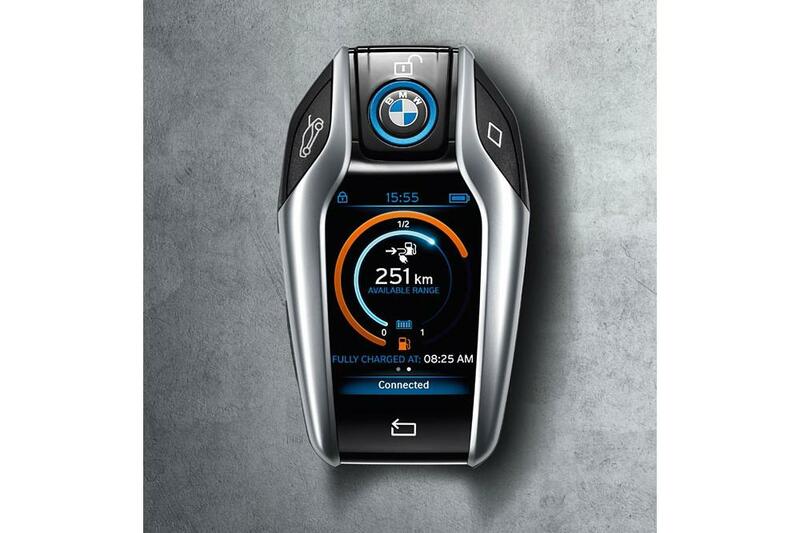 Bimmerfile reports that it will have its own high resolution LCD screen and will let you know information about the car wherever you happen to be. The main information you can expect will have to do with the car’s available range, how much charge is in the batteries and how much gas is in the tank. Not only that, but you should be able to do things like preset the temperature for the car so it will be toasty warm in the winter or nice and cool in summer … before you ever get in. This sort of attention to detail in the i8 suggests that BMW took this project very, very seriously. It also bodes well for what the car is like to drive. Frankly, I can’t wait to take one for a spin.